FIBA has slapped suspensions ranging from one to six games on 10 Gilas Pilipinas players and three Aussies for their role in the brawl that marred the two nations' Fiba Basketball World Cup Asian qualifier last July 2. 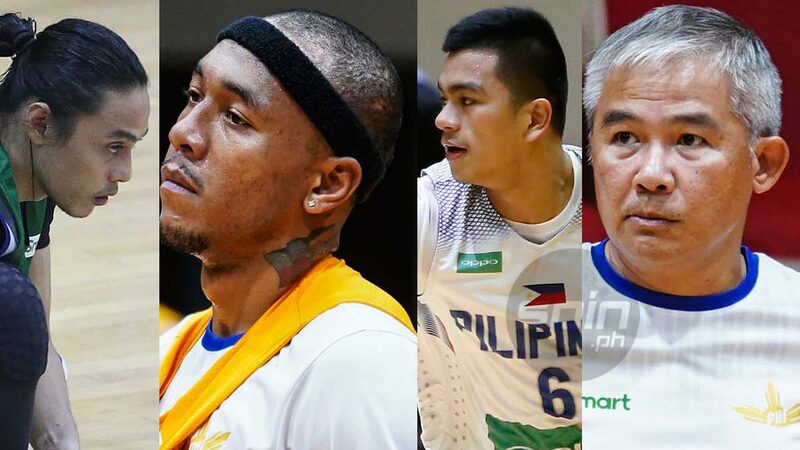 Of the 10 Gilas players, Calvin Abueva received the brunt of the punishment handed down by the world basketball body with a six-game ban while Jio Jalalon, RR Pogoy, and Carl Bryan Cruz were suspended for five games. Given three-game suspensions were Terrence Romeo, Jayson Castro, naturalized player Andray Blatche, and Troy Rosario while Japeth Aguilar and Matthew Wright each received one-game suspensions. Gabe Norwood, June Mar Fajardo, Baser Amer and Allein Maliksi were spared from suspensions which will not extend to the players' games in PBA. The Samahang Basketbol ng Pilipinas (SBP) was ordered to host the country's next home game in the qualifiers behind closed doors, was handed a ban for two more home games, and was placed under a probationary period of three years. The SBP will also have to pay a disciplinary fine of 250,000 Swiss francs (roughly P13 million). Even Gilas coaches Chot Reyes and Jong Uichico were not spared. Uichico was also slapped with a three-game suspension for unsportsmanlike behavior, while head coach Chot Reyes was suspended for one game for ‘inciting unsportsmanlike behavior’ and ordered to pay a fine of 10,000 Swiss francs (roughly P530,000). Boomers big man Daniel Kickert, whose forearm to Pogoy's chin sparked one of the worst brawls in modern basketball history, was given a five-game suspension, NBA player Thon Maker received a three-match ban while Chris Goulding was banned for one game. Basketball Australia was fined 100,000 Swiss franc for 'unsportsmanlike behavior' of its players as well as for 'abusing and/or tampering of equipment' for removing the decal sponsorship stickers during practice at the Philippine Arena on the eve of the game. Fiba also handed down one-year suspensions on the three referees that officiated the match — Ahmed Al Bulushi of Oman, Hatim Alharabi of Saudi Arabia, and Paul Skayem of Lebanon. Fiba explained Abueva received a six-game suspension because of prior unsportsmanlike behavior in a Fiba competition. "Fiba wishes to emphasize that it condemns any form of violence, both on and off the court. Respect, sportsmanship and professionalism are expected from players, coaches, officials and all other stakeholders at every game. Moreover, host countries must ensure the highest standards of organizational conditions are in place to guarantee the safety and well-being of players and other participants at all times," the world body said in its verdict.